Horizon Cable has over 35 years of experience in the sales and service of industrial rigging hardware. Trust the professionals at Horizon Cable for spreader bars and all of your rigging needs, no matter the size or application of your job.reader bars for your industrial project. Call Horizon Cable today at 866-369-9507 for more information about spreader bars and all your rigging hardware solutions. The spreader bars, also referred to as spreader beams, are common industrial lifting devices available from the industry experts at Horizon Cable. Similar to lifting beams, spreader bars come in fixed or adjustable lengths, and typically have lifting points on the top, bottom and on opposite ends. 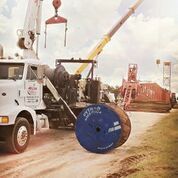 The manufactured spreader bars offered by the professionals at Horizon Cable are proof tested to 125 percent capacity for added safety. The spreader bars offered at Horizon Cable can be used for a wide variety of industrial applications. Lightweight and reusable, our spreader bars meet all industry requirements and will fit into your budget. Spreader bars are used with a sling to distribute the weight of a load over more than one point to increase the stability of the transfer. Safety is a top priority when working with complicated and heavy industrial machinery. Horizon Cable puts safety first for spreader bars and all of its rigging equipment and accessories. Call 866-369-9507 now and talk to one of our industry professionals about how Horizon Cable can provide the spreader bars you need for your industrial lifting project or job. Or simply click the “Quick Quote” tab to the right and one of our knowledgeable representatives will respond shortly.